Democratic Alliance defence spokesman David Maynier on Thursday made public copies of what he said were contracts between defence advisor Fana Hlongwane and companies linked to the arms deal pointing to corruption. "The documents amount to prima facie evidence of bribery and/or corruption and raise some serious questions," Maynier said in a statement. The contracts appear to be between Hlongwane Consultancy (Pty) Ltd and BAE Systems, and its local subsidiary South African National Industrial Participation (Sanip). Maynier said they showed that Sanip paid out tens of millions of rands to Hlongwane and companies he was involved in between April 2003 and September 2005. 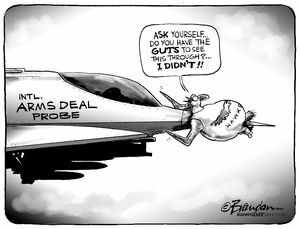 Calls were made last week for a new arms deal probe after the chief executive of SAAB, Hakan Buskhe, said an internal investigation at the company showed that BAE, its partner in the arms deal, had paid R24 million through Sanip to a "South African consultant". SAAB and BAE secured the contract to supply South Africa with 26 Gripen jets as part of the country's controversial multi-billion arms deal. Last year, the Hawks decided to close the remnants of investigations into alleged corruption linked to the arms buying spree. The head of the elite unit, Anwa Dramat, has come under fire after it emerged that he took the decision on the basis of an error-ridden six-page memorandum from the commercial crimes unit. The unit has been criticised for failing to fully take proper account of information provided by the United Kingdom's serious fraud office. Maynier said he planned to hand the documents to Dramat, and to Parliament's watchdog Standing Committee on Public Accounts (Scopa). This week, Scopa undertook to ask the Hawks and National Prosecuting Authority to provide further clarification, in writing, of its reasons given in the memorandum for deciding to abandon the arms deal probe. Allegations of corruption linked to the arms deal first surfaced in 1999. With acknowledgements to Sapa and Sunday Times. This Fana guy is a commission agent. He gets the commissions from BAe and Saab and spreads it about. He also keeps a lot for himself because he will say that he has exposed himself to considerable risk. He is also as lawyer trained in the Ukraine. He also considers himself to be a defence expert, at least good enough to sit on the MODAC MOD Acquisition committee - that structured the Arms Deal in the first place. So a whipper snapper of 40 years, for that was his age in 1998, gets R250 million to spread about and keep a bit. Unlike his commission colleagues, he has a more charmed life and fails to get call for a meeting from Lucifer in the sky with diamonds. Instead he lives in a mansion in the plushest northern suburbs of the city lined with gold, entertaining young white lasses that arrive one the hour every hour clutching a bottle of French champers, a brace of viagra and some prophylactics. If the German Submarine Consortium had been successful in its NIP, the latter might even have been made in a factory in East London called Condomi. Sadly the NIP was but smoke and mirrors. The rubbers must be imported. But who will prosecute this high liver when he filled their troughs and helped their party get 66% of the national vote?